There are some things in life that simply cannot be understood by anyone other than a husband and wife. No one will ever know the rush you felt when you shared your first kiss, how emotional you both were at the moment of his proposal, or how your heart skipped a beat when you saw each other for the first time on your wedding day. Only you can understand the depth of your everlasting love, and the promises of commitment you make to each other. Some things are sacred, to be kept within the relationship, and only known, and felt, by the two of you. Like the special memories shared between a man and woman, the Shimansky Circle of Love collection offers a characteristic known only to the couple who wears the rings. Two circles of round brilliant cut diamonds are precision-set on either side of the solitaire diamond engagement ring, as well as the matching men’s and women’s wedding bands. A brilliant sparkle visible only to the wearer of the ring, the diamonds add a unique personal touch that gives the wearer a feeling of exclusivity and luxury. Knowing that you and your partner’s rings have matching circles of diamonds visible only to the two of you, is truly unique, like a secret known only by you, the couple. The collection is a personal testament to the promise of love between a husband and wife, and a truly unique concept designed by Shimansky. The Circle of Love collection is available in either platinum, or 18K white, yellow or rose gold and can be customised to your liking with either a round brilliant cut diamond, an Eight Hearts diamond or a Brilliant 10 diamond. The round shaped diamond is a traditional favourite for South African engagement ring buyers, as it has been used for decades due to the radiance of its brilliant sparkle. It is a truly timeless shape that will never date. The round Brilliant 10 diamond is a Shimansky exclusive, and is the most brilliant diamond cut in the world. It reveals a perfect ten heart pattern when viewed from below and a perfect ten arrow pattern when viewed from above through the Ideal Scope. In a class of its own, the Brilliant 10 diamond has 71 facets precisely aligned for an intensity of light, second to none. The round Eight Hearts diamond cut is another Shimansky speciality, and takes three times longer to polish than other diamond cuts. It displays a perfect eight heart pattern when viewed from the bottom and a perfect eight arrow star when viewed from the top – a true Hearts and Arrows diamond. Universally recognised as one of the most meaningful symbols, a circle has extensive significance to people across the globe. The most common representations are that of totality, eternity and wholeness, all of which are relevant to the giving and receiving of an engagement ring and wedding band. Like a circle with no end, there is no finality to true love. Getting engaged signifies the decision to spend an eternity together. It’s only appropriate, then, that this special occasion be marked with a ring that represents “forever.” Just like a circle is complete and whole, when a man and woman join together in marriage, their relationship becomes complete. They give all of themselves to each other, knowing that their love will last until the end of time. 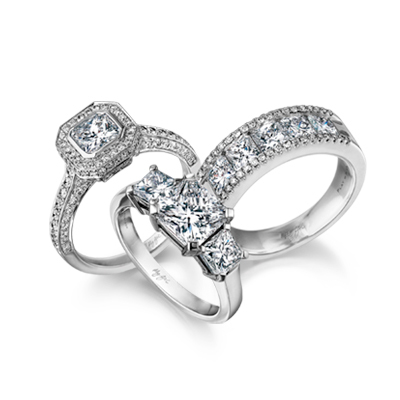 The two circles of diamonds in the Circle of Love collection are created for a love that knows no end. They complete the ring, and the promise, just like you and your partner complete each other.